The police are having the last laugh on this one. 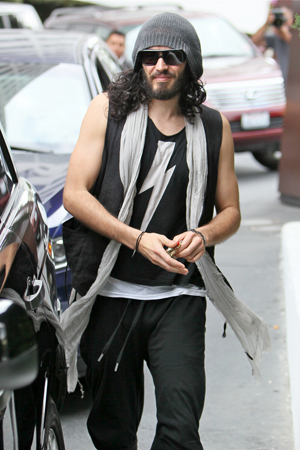 After Russell Brand went a little cray-cray and tossed a photographer’s cell phone through a window, an arrest warrant has been issued by New Orleans authorities. Boy, yous crazy! It will be quite a trick for the comedian to joke his way out of this one.… An arrest warrant has been issued for Russell Brand in New Orleans. The British comedian reportedly snatched an iPhone from a man in a car, when the latter attempted to snap a photo of the star. Brand then flung the phone through a window of a nearby building. There are several explanations for such an outburst. Brand could have been hungry and thus cranky. Or he was thinking about last Friday night. (Ha! Subtle Katy Perry reference…) Or perhaps the comedian is still stuck with a flip-phone and was jealous of the photographer’s super hip and modern iPhone. Who knows? Nothing a cup of chamomile tea and a hefty chequebook can’t fix, yes? The lesson here is: Do not toss cell phones through windows. Hopefully, that’s something we can all manage. Russell Brand sets his sights on Cameron Diaz?